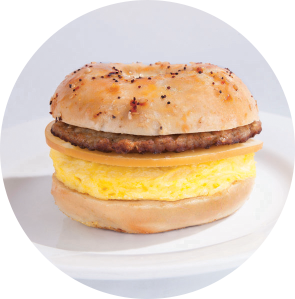 Spicy Pork Sausage, Scrambled Egg Patty with Gouda Cheese on a New York Style Everything Bagel. Everything Bagel (Flour (Wheat Flour, Malted Barley Flour), Water, Sugar, Contains less than 2% of each of the following: Sesame Seeds, Poppy Seeds, Dehydrated Onion, Garlic, Degerminated Yellow Corn Meal, Salt, Yeast, Guar & Xanthan Gum Blend, Inactive Dry Yeast, Soybean Oil, Ascorbic Acid added as a Dough Conditioner, Enzymes), Southern Spicy Pork Sausage Patty (Pork, Water, Salt, Spices, Dextrose, Sugar), Scrambled Egg Patty (Whole Eggs, Non Fat Milk, Modified Food Starch, Salt, Xanthan Gum, Citric Acid, Pepper), Smoked Gouda Cheese (Gouda Cheese (Pasteurized Milk, Cheese Culture, Salt, Enzymes), Water, Sodium Phosphate, Potassium Sorbate (preservative), Apo-carotenal (color), Natural Smoke Flavor). Contains: Wheat, Milk, Egg, Soy and Sesame.